Microsoft pushed the upcoming new feature update for the company's Windows 10 operating system, called the May 2019 Update, to the Release Preview ring today. Feature update logic changes with the release of the May 2019 Update. Windows administrators who did not want their devices to be updated automatically to new feature updates had to defer updates or change updating behavior otherwise to avoid that and to never click on "check for updates" manually either. Select "Get started" on the Windows Insider Program page. You can verify that the PC joined the Release Preview ring by opening the Windows Insider Program page in the Settings app again. 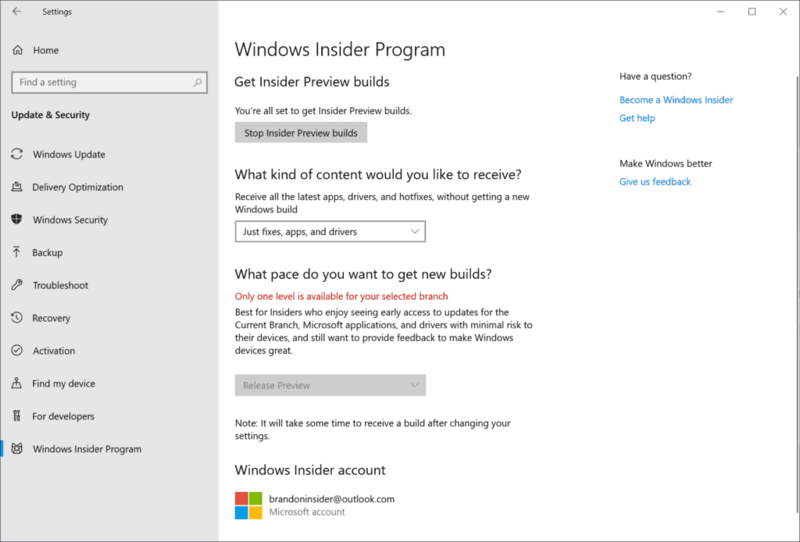 It should display "Just fixes, apps, and drivers" under "What kind of content would you like to receive", and a button to "Stop Insider Preview builds". You need to run a manual check for updates to receive the May 2019 Update. Go to Windows Update in the Settings application and click on "check for updates". The PC should pick up the new feature update and download it to the system. with the announcement of 2019 May upgrade, I fear I am an update behind, still running 1803.
question is what I should do? bee- force an update from 1803 to 1809 before the new 1905 update will reach me? 1803 is still supported for a while so there is no hurry right now to make a decision. If possible, I’d skip the 1809 version probably. Create a full system backup regardless of the decision that you make! I’m still on 1803 too and had wondered if installation of Windows Updates are dependent on what’s on the system already. I half-jokingly thought it would be better to forget 1809 ever existed and skip it. So, Martin, are you saying that it’s not necessary to have 1809 installed before 1903/5 gets installed? I’m in Australia, so I’m not holding my breath either way (I didn’t get 1803 until around June). PSA: Don’t install if you have a Creative sound card. The Creative AE-5 for example doesn’t work. Be prepared to do a “Clean Install”. Windows “upgrades” have never worked very well. “Insanity” = Doing the same thing over and over expecting the results to be different. Are lottery winners who played the same numbers for each draw ‘insane’? Considering how many different hardware configurations that can/are running Windows, it’s surprising that it’s still a viable OS in it’s present state. Yes, even a child knows that, but it seems Microsoft management does not. Why would they attempt to do so many updates without testing and think everything would be ok? They couldn’t even maintain their old schedule and they doubled down on failure. On top of that they even fired their QA department and replaced it with AI-based testing which itself is experimental. Customers are paying beta testers for Microsoft. After so many upgrades, a clean install will indeed be required. Example, I was helping a friend diagnose why her PC was so slow. It was a self build of top of the line components then, an Intel Core Q9650 CPU, 16GB DDR3 RAM (which was just then released, huge boost over DDR2 & DDR4 didn’t have quite the same percentage boost versus), a SATA-3 add-on card (not quite that speed, yet close), lots of goodies to include a EVGA GTX 1070 FTW, although running at PCIe 2.0. The system was later cloned to a 512GB Samsung 850 Pro SSD, yet note that this was not a clean install. The underlying file system was a 1:1 copy of the second HDD installed, a 500GB WD RE4 (great HDD at the time!). Still used as a data drive today. Anyway, turns out that she upgraded Vista Business 64 bit to Windows 7 Pro, later Windows 8 Pro during the $40 promo with free Windows Media Center key, then a few months later, 8.1, then all of the Windows 10 releases up to 1803 at the time it came to me. Is there any wonder as to why it was running slow? It’s a miracle the system was booting in the time it was, given the age of hardware, still around 40 seconds, and another 45-seconds to a minute for everything to load. Have seen such systems that wouldn’t run at all. It’s like piling one roof on top of the other, eventually something will give. Which would be the case here, programs had been loading loading slower with every upgrade, tried several times to fix with sfc /scannow & DISM commands, to no effect. So after a in-place repair install, which left all software installed & ran a bit better, yet not much (actually a better alternative to Refresh on a not too old clean install), I recommended a clean install of Windows 10 1803. The only thing needed were her license keys for installed software, some were shown, such as MBAM Pro (Lifetime). Once she found all of the licenses, I then (after imaging the drive) performed a secure erase of the SSD with Parted Magic (not the Enhanced, rather the regular which gets the whole drive), took less than 30 seconds, installed 1803 64 bit clean & was fast as ever. She was very happy with the outcome & more so was I, because was trying every trick I could find to get things to speed up to no avail. So yes, there’s times when the clean install is the best way. Just make sure that any needed drivers are on hand, actually Windows 10 does a great job at finding these, yet there’s some that still needs to be loaded before install (F6 Mode). Fortunately today, we can use a Flash drive rather than floppy for this purpose, or better yet, slipstream the driver(s) into the bootable media. At any rate, a clean install is usually a happy one!